This is the time for Gu Li's tesuji. Ed? 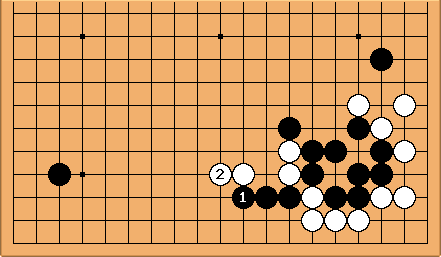 Black 'a' looks like a good move to me. 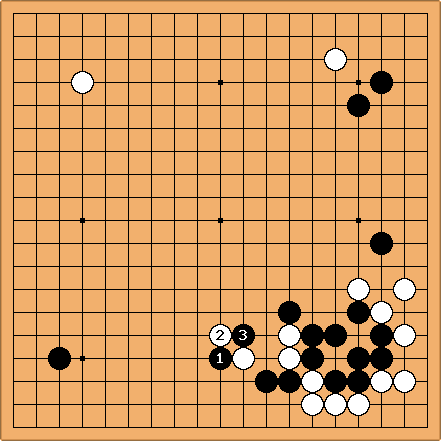 If white 'b' black pushes through at 'c' and captures 2 stones instead of the 1 captured by pushing immediately. If white 'd' black plays 'b' and has made it up to the 4th line. If white 'e' black 'd' appears to catch the cutting stones. captures a stone, but this does not compensate for the weakening of his big group. This crawling is not desirable. The expected shape destroying move would be . 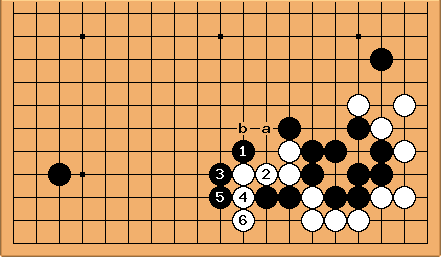 After captures two stones, Black can solidify his influence with a or b, but the position can still be considered as thin. Jasonred : Hold on... so, the extra stone at 7 and extra stone captured IS worth the weakening of the main group? I assumed the 8,9 sequence, is that correct? crux: It appears that professionals think that way. 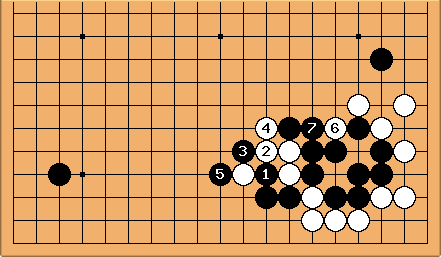 There's a similar observation somewhere in Invincible, where a move that causes Shusaku to capture three stones instead of two is called the losing move. Bill: I think it makes a difference of more than 4 points. 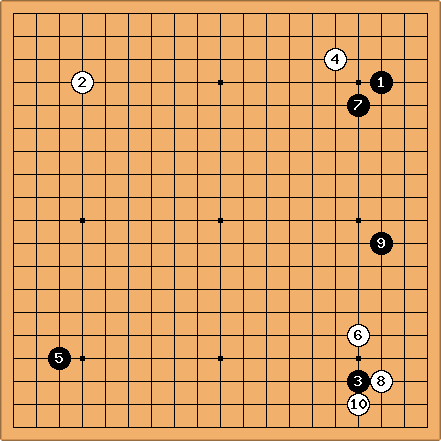 tderz: this is a standard tesuji, available also to mid-level amateur players like me. I just wonder, how would one call this tesuji? -> YokoTsuke? Bill: Yes, I would call it a yokozuke, but I am not sure if that is standard.